Thank goodness this is only supposed to happen once in this lifetime. It was such a bad experience I’d be loath to wish it on an enemy! To start with, the registration location (“Badminton Hall”) was ridiculously hard to find and there was a lone policewoman trying to impose order outside. She did eventually let 10 people in at a time. Her directions about what to do inside were literally directions: “Turn right.” What I saw is what you see. And beyond these people were ceiling high stacks of paper. After waiting in two lines (once to receive a “number” – ward? Jaago Re neglected to mention this one) this absolutely rude woman said she couldn’t accept my PAN card as proof of my date of birth (regardless of what their web site says) and if “sir” said it was ok, she’d take the voter registration application. But “sir” flipped past the PAN card and fixated on my mobile phone bill as not being valid proof of address, instead. After raising my voice and demanding his name and ID number (to the absolute unconcealed delight of at least 300 people), I finally got them to accept my application and give me the counterfoil. 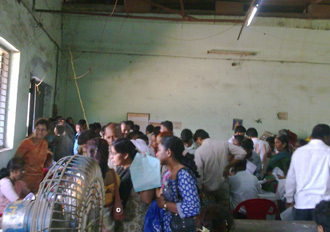 All around me, people were being turned away for missing documents. There was someone in line ahead of me who’d returned for the fourth time! Why is the correct information not publicly available? And how can these officials be this rude to fellow human beings? It’s the same every where, Jago Re did say something about ward number, and thats one thing I couldn’t search on their website, it would take me to a map! So I decided to walk into the Party office of this new Political unit set-up by actor turned social worker turned politician dude, reportedly A.P. state government has facilitated online registration and the party workers had all the info, and helped me file online, almost a month later some govt official came home snapped a crappy pic, and finally I have my voter card. the Ration Card served both address & ID proof, they don’t accept PAN for address, neither mobile-phone bill! Wonder how they expect the people to know all this, we don’t study in social studies either! shouldn’t there be a chapter on this? hmmmm…i did my registration 2 years ago and it went off without a hitch, except that they combined and distorted my first and middle names to make me kristophernicus (oh yeah!!! now that’s a name i’d like!!!). there was a lot of jostling with sweaty people, but everything was done in 4 hours, in the first try and the first standing in line. Hearing about experiences like this, one wonders how easily the bogus names are added and honest, law-abiding citizens are left standing in line. My experience is no better … waiting for name to get added and get EPIC. & this is why films about vigilantes have an ‘appeal’ .. if every official wasn’t such a lazy so & so that hated their job & vented on the public would we need a Goddamn Batman?! no wonder ppl dont want to vote or make efforts to get their voting cards made. sad state man sad state. Nicely described… it’s indeed a hell of a experience to deal with these folks. This is the usual scene at the rural areas. Too many people do queuing at the last minute. Thus, this very disorganized situation. Computerization might help but its too costly. Better to spend to help the needy. And this is the reason I read http://www.chhavisachdev.com. Stunning post. Good idea! Can be considered a learned thing, ok.
Chhavisachdev.com > this is how we do it (voter registration 101) as the entry title around my Digg.net bookmark, as I guessed if it can be fantastic sufficient for you to title your blog publish that, then you definitely almost certainly would like to view it book-marked the identical way. nice website I like the layout.